The iPad, iPod touch, and iPhone make excellent toys and learning tools for kids, but if you’ve seen a youngin’ with an iOS device you know it’s only a matter of time before the inquisitive mind of a child escapes the current application and ends up elsewhere. That inevitable sequence can be stopped in its tracks thanks to Guided Access, a great new feature brought to iOS in 6.0 that basically functions as “Kid Mode”, whereby any iOS device can be locked into an application with the hardware buttons disabled. This is one of those must-have features for teachers and parents, and using it is easy. 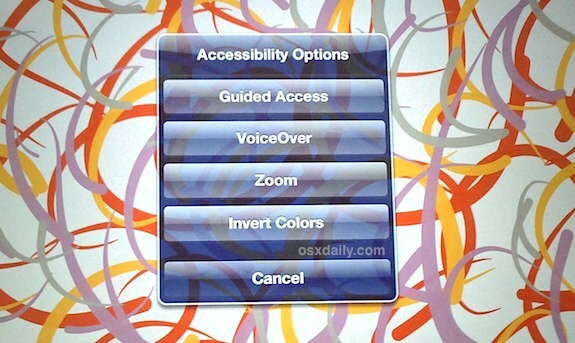 As mentioned already, you will need iOS 6 or later to have this feature. 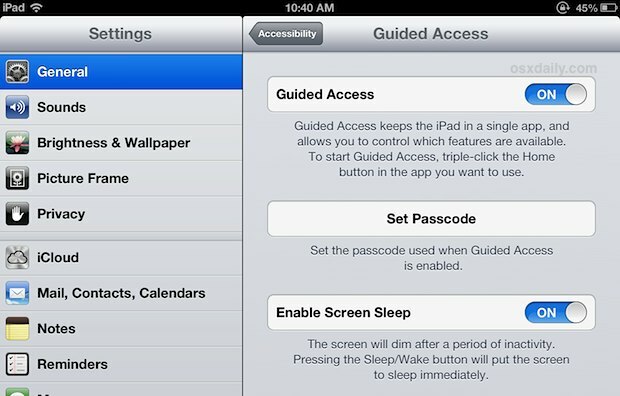 Now that Guided Access is configured, you can use it to lock the iOS device into any app you want. The iPad, iPhone, or iPod touch is now effectively locked into the current application, and pressing the Home button will no longer leave the app. Sooner or later you’ll surely want to escape out of this mode though, but only those with the passcode set earlier can do so. You’ll now be back to the usual behavior of iOS. If you’d like to turn off Guided Access completely, just go back to Settings > Accessibility > Guided Access > and flip the setting to OFF. You’ll need to enter the passcode again to do so. Though the Mac doesn’t have the same features to lock into an app by default, there are some simple tips to make Macs more kid-friendly too. It should be noted that sometimes, changing the orientation of the device is enough to place buttons in an unprotected area of the screen, thereby allowing the user to escape a lot of restrictions. Until Apple fixes this, it is much too easy for children to snap out of the reserved screen or feature(s), even completely by accident. Yes this is true, but if you use screen orientation lock it won’t be a problem. Most of the time you just put a game or book with a kid and they stay in landscape mode. The only potential issue I noticed is you can still reboot the iPad/iPhone by holding Home + Power for 15 seconds, though that probably must stay in place for a variety of reasons. Hi Pixle, is your app already available on Apple apps store ? I am very interested. Would love to hear your feedback soon. Thank you. Well there are some bugs with this, some apps are getting stuck in Guided Access and you can’t get out. Great. Apparently not enough beta testing with third party apps! I hit this problem when I was testing the feature with iOS Notes app, so it is not just 3rd party apps. However having hit the problem and use the reboot work around I have not been able to recreate the problem. Can anyone recreate the problem consistently if so can it be reported to Apple? Yes, the bug is very annoying. Note to readers that it’s a genuine bug: in some apps, sometimes, triple clicking the home button and power button fails to do anything, while in Guided Access, so you cannot even enter the password. this is what happened to me! So what can I do? My iPad is not usable now! OMG I did this and now it is stuck! It says to triple click the home button to get out, but when I do nothing happens! My iPad is stuck on the Sprout app and I can’t turn it off or anything! WTF do I do??? This is awesome!! Fantastic to now know how to use this for my 14 month old loves hitting the home button on the iPhone and iPad, closing her Fisher Price Apps. my mine is ipad mini, i am stuck on viber..
any one can help me back to original settings..
my ipad is stuck in a guided access mode, and wont work, as it will only reboot and I will enter my password only to be locked to my homescreen. I can touch the screen and nothing happens. the words “Guided access app unavailable. Please contact your administrator” are in the middle of my homescreen, and will not go away. this is a school ipad, so respond ASAP because until this is fixed it is useless. this didnt work on my iphone 5! We have just released an iOS app (working for both iPad and iPhone) that allows users to disable touch screen inputs all over the screen when viewing any image. The source of image can be from your photo album, camera, or clipboard (image that you copied from any source such as browser or e-mail, etc.). This was developed to solve the frustrating problem of accidental touch on screen using an intuitive interface which allows freezing/unfreezing with minimum interaction. You will find it much more user friendly that the “Guided Access” feature of iOS if you are interested in freezing the touch for images. For example no password is required or no areas on the screen need to be defined. Name of the app is “Still Screen” and the link is below. Please let us know if you have any feedback and suggestion to improve the app. Thanks. My home Button does not work now.. I’m in guided access. What do i do? I tried to run out the battery but when i startet it up again it went straight back in to the same app and mode..
Was this app ever made available? Kids mode is so convenient on my Samsung tablet. You pick available app access and it times out for you. 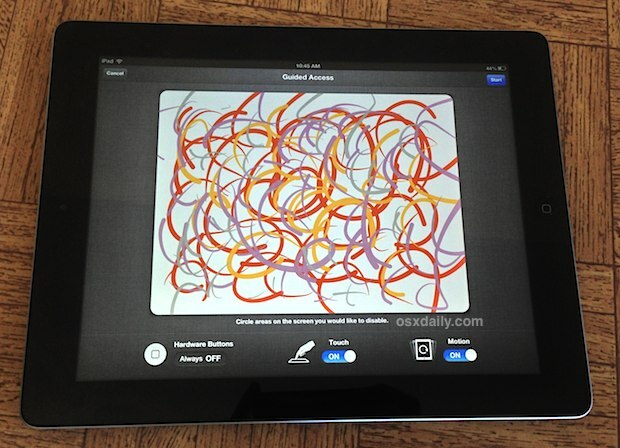 Sounds like this is what everyone is looking for with the ipad. Apple apps are buggy as hell. Ive got an imac from 2000 that still works but my ipad is now unsupported? Apple have lost their way ruled by users that dictate how things need to work but have no experience whatsoever.